Your podiatrist will often diagnose that sharp pain in your heel as a heel spur – so how do they occur? 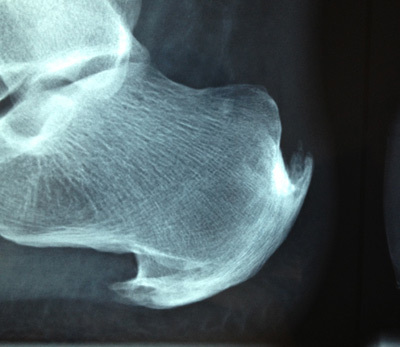 If you have been having heel pain your doctor may have referred you for an X-ray, which may reveal heel spurs. This X-ray shows a heel spur at base and the back of heel. Heel spurs occur over time from stresses to the plantar fascia or Achilles tendon which pull on the bone causing calcification forming the spur. So it is not the spur itself causing the pain but in fact the tendon that attaches to the bone. The attachment gets inflamed and it is the inflammation causing the pain, with/or without associated other soft tissue involvement. Around 60% of people with spurs are asymptomatic (don’t have symptoms). As it is not the spur causing the pain, surgical removal of a spur is not needed or advised. Instead, orthopaedic surgeons will more than likely suggest you consult with your podiatrist for orthotic therapy. Sometimes your practitioner might be concerned about a stress fracture or an acute fracture so they may like to X-ray the heel (calcaneous) but stress fractures are not very common at this site. The most common reason for heel spurs is plantar fasciitis which is an inflammatory process at the attachment at the heel. Other causes include poor footwear, trauma, pronated foot type, supinated foot type, being overweight, or age. It is important to note that heel pain in children is most commonly a condition called Sever’s disease. In the worst-case scenario the plantar fascia can tear or rupture, which would be determined by an ultrasound. And this may need to be offloaded with a moonboot. If you are suffering from heel pain, book in with your podiatrist at The Foot Group immediately. It is treatable and should not be ignored.